It hit me like a thunderbolt today. Why not feature a guest post once a month? That’s certainly doable, provided I can find people willing to submit reviews (ahem…Tina). It gives me the opportunity to provide you with sites I can’t get to easily. Still biding my time until they put the finishing touches on the Transporter teleportation machine. Can I get a witness, fellow Trekkies? Remember when satellite dishes were this big? Here’s what I love about the subject of this post. Lucas is a town with a population of just 400, yet it has a website and a Facebook page! Also, it’s really close to Lebanon, KS, which is the geographical center of the contiguous United States. Look at a map and see what I mean. Nifty. I also think this souvenir plate, made from repurposed satellite dishes, is an über-cool example of recycling. I’m not exactly Mrs. Green, but I do shut the lights off when leaving a room — regardless of whether others are still there. This tends to bother Matt when he’s watching his DVR’d episodes of The Closer. 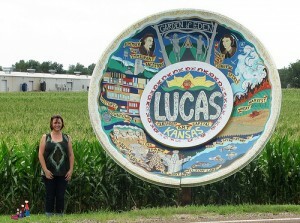 We found the World’s Largest Souvenir Travel Plate on the outskirts of Lucas, Kansas. My family was on a whirlwind tour of North Central Kansas, which is not complete without a stop in Lucas, home of the Grassroots Art Center. On this trip was myself, my husband, Doug, my daughters Brenna, age 5 and Caelan, age 3, and my mother, Chris. We stopped in Lucas because of the Grassroots Art Center and the Garden of Eden, both of which have to be seen to be described; words just can’t do justice to them. We were told by so many people the town was not to be missed. Lucas is one of those original towns that is just quirky enough to be cool. This plate was a city-wide effort. 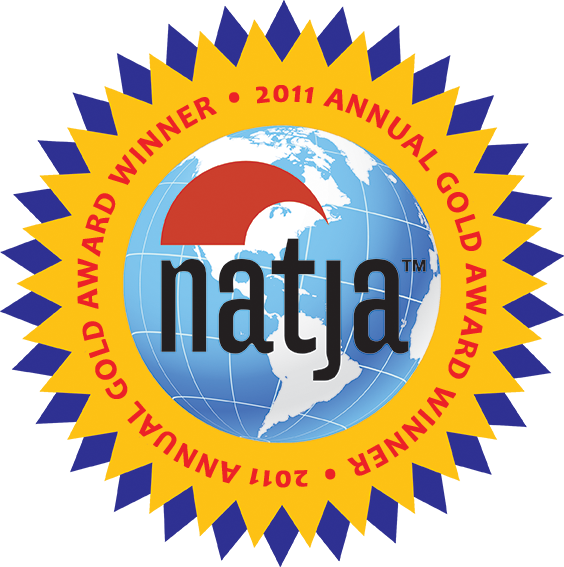 It is constructed from two satellite dishes, the largest 14’. It just really gives you a feel of what you will encounter in Lucas – from pop tab motorcycles to limestone houses. The plate itself isn’t terribly exciting; alone I give it a 3. But if you add it with the town of Lucas I would up that to a 7 or 8. Interesting just doesn’t come close to describing what you will see. Lucas, Kansas was voted one of the “8 Wonders of Kansas Art,” and is known for being a center of grassroots art. 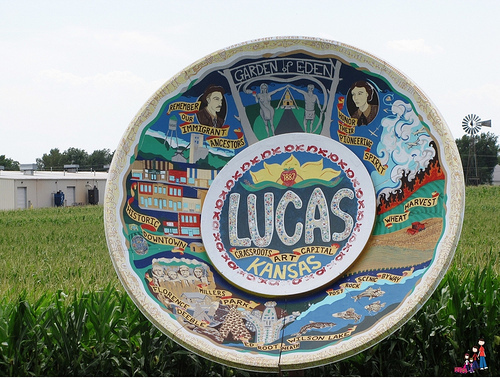 The plate is painted to completely represent Lucas, including wheat, the local meat market, and the art that has made it famous. The dish itself is 14’ in diameter, formed from a large fiberglass satellite dish with another, smaller dish mounted inside as the center medallion. Funded by a grant from the National Endowment for the Arts, the plate was installed and painted by Erika Nelson in 2006, alongside state highway K-18. Here’s more detail about the artwork on the plate.